Showing the audience how journalists approached the story. We added an “explain your process” box to a news story that explained why and how the story was covered. This was tested using two experiments with 1,312 total participants. Demonstrating balanced coverage of partisan topics. We added a “demonstrating balance” box that directed readers of a partisan political news story to another story that offered an opposing partisan focus. This was tested using two experiments with 1,233 people. Using a mock news site, people who viewed a news article with the box perceived the news organization as significantly more reliable, compared to people who saw the same story without the box. 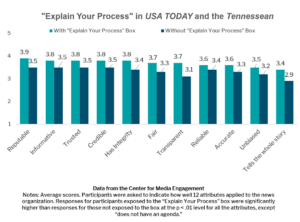 Using stories from USA TODAY and the Tennessean, people who viewed an article with the box rated USA TODAY and the Tennessean significantly higher on 11 of the 12 attributes of trust compared to people who saw the same story without the box. These attributes include being more transparent, informative, accurate, fair, credible, unbiased, and reputable.1 Only does not have an agenda was not significantly higher. Our findings suggest that news organizations consider adding an “explain your process” box to news stories. Participants who saw a story with the “demonstrating balance” box rated the news site significantly higher on two attributes: fair and does not have an agenda. Further statistical analyses showed that the effects were too small for us to suggest that news organizations will benefit from adding a “demonstrating balance” box to news stories. The box included how and why the news organization decided to pursue the story and where reporters gathered information. We tested the “explain your process” box in two separate experiments – first with a mock news site and then with real local and national news sites. The two news outlets, both part of the Gannett chain, provided us with examples of real stories from their sites. The USA TODAY story focused on Amazon’s efforts to find a new headquarters, and the Tennessean story was about a viral Facebook post that gave a mistaken impression that a veteran had been declined medical care. Most Americans want news from both sides of the political spectrum.11 So, we tested how people would respond to a news organization that covered a topic from two different viewpoints. Study participants either saw a story that focused on research suggesting gun control is needed to prevent mass shootings or a story that focused on studies suggesting approaches other than gun control have greater merit in preventing mass shootings. Half the participants saw a story that included a “demonstrating balance” box, which linked to the story expressing the opposite viewpoint. We tested the “demonstrating balance” box using two separate experiments. In both experiments, we used our mock website, The News Beat. Our first experiment had 791 participants and used the same 12 items (e.g., transparent, credible, informative, etc.) mentioned earlier to evaluate participants’ opinions about The News Beat.12 Participants perceived the news organization identically on all 12 items regardless of whether they saw the “demonstrating balance” box or not.13 There are a number of possible explanations for this finding, including that a box like the one we tested is not an effective method for demonstrating balanced news coverage in an online news site. Another possible explanation could be that the box needed to be more prominent. Nearly half the participants who were exposed to the “demonstrating balance” box did not remember seeing it. Our experiments tested several strategies for building trust in news. As a result, we suggest that news organizations consider using the “explain your process” box. It is relatively easy to put this box together using information from the reporters’ news-gathering process and can improve items that relate to trust, particularly in the experiment involving USA TODAY and the Tennessean. We cannot recommend using the “demonstrating balance” box at this point because our findings were inconclusive. In summary, small steps by news organizations can have an influence on building trust with their audiences even if every approach does not work. We encourage news organizations to continue experimenting. This project was led by the Center for Media Engagement and Joy Mayer of Trusting News. Trusting News is a project of the Reynolds Journalism Institute and the American Press Institute. It is staffed by Mayer and Lynn Walsh. All four experiments were embedded in Qualtrics-based surveys. Participants were recruited in different ways for each study. Participants for the first “explain your process” experiment were recruited via a Qualtrics panel. For the experiment involving USA TODAY and the Tennessean, the news organizations recruited participants in various ways, including through social media and newsletters they send out to their audience members. For the two “demonstrating balance” experiments, participants were recruited via Research Now SSI for the first experiment17 and via Amazon’s Mechanical Turk for the second experiment. Qualtrics panels and Research Now SSI were used to create samples that matched the demographics of U.S. Internet users taken from a nationally representative, random sample survey conducted by Pew Research Center. Amazon Mechanical Turk also yielded a sample that was relatively close to our Pew demographic targets. Finally, although the sample recruited through USA TODAY and the Tennessean does not reflect the U.S. Internet demographics, it represents the audiences of both sites, particularly those engaged enough to respond to a survey. All surveys and survey procedures were nearly identical across the studies. After participants answered screening questions to verify their age and U.S. residency, they were asked questions about their education, income, gender, and race. Following these questions, each person was randomly assigned to one of the experimental conditions. In the “explain your process” experiments, participants saw an article either with or without the “explain your process” box. In the “demonstrating balance” experiments, people saw an article with or without the “demonstrating balance” box. Participants were asked to read the news article and browse the page as they would normally do on a news site. After leaving the article page, participants were presented with a series of identical questions aimed at gauging their opinions about the news organization that published the article.